Find out what is going on at Bell & Spina. and all the 40 under Forty award winners. Dan will be discussing the essentials of a successful masonry restorations. Dan specializes in the evaluation and restoration of many types of façade systems including stucco, marble, granite, limestone, terracotta, brick and architectural precast concrete. He analyzes and troubleshoots facade issues by approaching the assembly as an integrated system while considering materials and practices used during the period of construction. Bell & Spina's Morrill Hall roof project featured in "The Cornell Daily Sun"
Morrill Hall is currently undergoing a roof replacement that began in mid-June and is slated to be completed by December. The 2-million-dollar construction project will primarily improve the drainage system of the 150-year-old building, according to Andrew Magre, associate vice president of engineering and project management. Neil W. Garry, PE, RRC, REWC (center) representing Bell & Spina at CSI Rochester award ceremony. 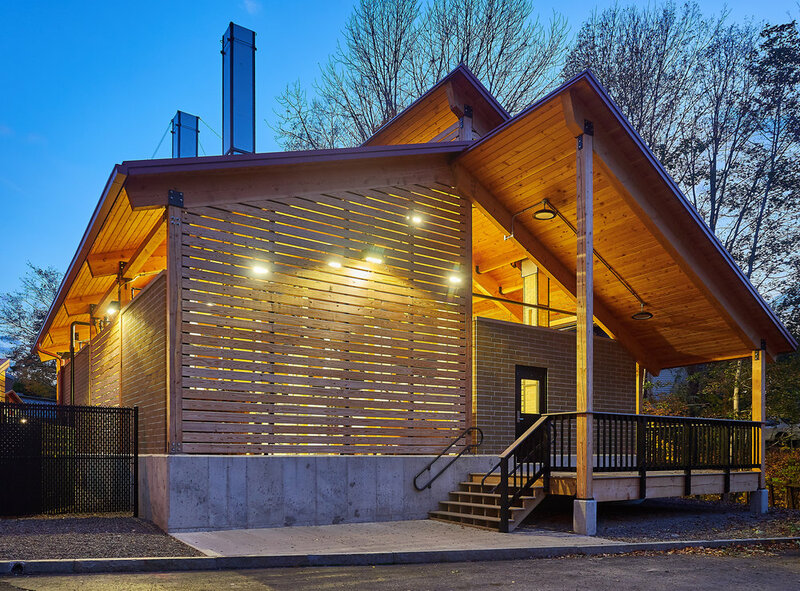 Bell & Spina Architects-Planners, PC received the “Flower City Award”, presented by the Rochester Chapter of the Construction Specification Institute (CSI) for the New York State College of Ceramics at Alfred University - Kiln Facility, for Outstanding Renovation. The project replaced the outdoor kiln structure Ceramics Program. 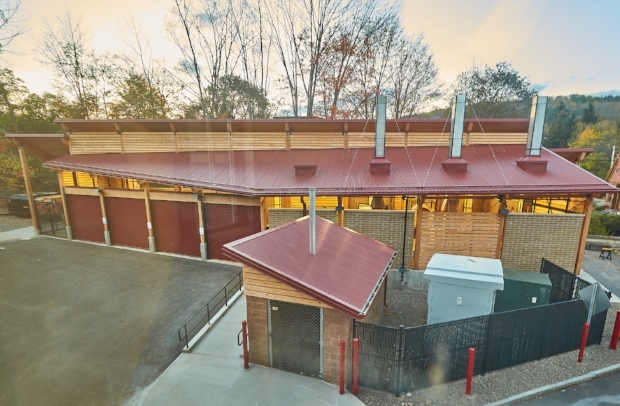 The existing facility consisted of a group of several metal and wood constructed sheds with varying floor elevations within a tight footprint, bordered by a creek bank, parking lot and Harder Hall. 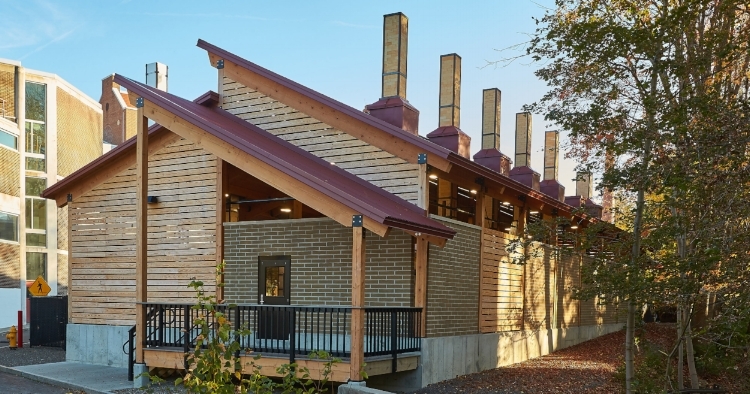 Accommodations for existing equipment in the new facility included 6 gas-fired downdraft soda/salt kilns, a single-chamber wood-fired kiln, a double-chamber wood-fired salt kiln and a Raku gas-fired kiln with room for additional kilns. Due to the caustic atmosphere created by the salt kilns, a heavy timber structure was designed for the new facility. A clerestory and slatted walls allow daylight to enter the building while protecting the year-round use of the kilns from harsh weather. Coiling doors allow for wood delivery and an outdoor secure, covered storage area accommodates glass cullet and surplus firebrick storage. The campus and State University Construction Fund were pleased with the final product, with campus staff stating that the building will act as a marketing tool for the program and one of the centerpieces of the campus. With offices in Syracuse and Rochester, New York, Bell & Spina has been providing architecture, building enclosure and planning services to the Upstate New York region for 30 years. For more information about Bell & Spina visit:www.bellandspina.com. CSI was founded in March 1948 by the specification writers of government agencies who came together to improve the quality of construction specifications. The Institute's efforts were essential in improving construction specification quality so that it could meet the demands of the post-war construction boom. Development of specifications best practices, promulgating standards/formats, professional education, and certification were cornerstones of the Institute. For more information about the Rochester Chapter of CSI visit: www.csirochester.org. On October 27, 2017, Bell & Spina Architects-Planners, PC received a Citation for Design award, presented by the CNY Chapter of the American Institute of Architects (AIA) for the New York State College Ceramics at Alfred University - Kiln Facility, under the “Institutional” category. On March 13th, Bell & Spina, Architects – Planners, P.C. was the recipient of two RCI Document Competition Awards. The RCI Document Competition is an annual event created to recognize excellence in roofing, waterproofing and exterior wall construction project documentation, with awards presented at their yearly National Convention. Albany's Egg is getting a new shell. Crews are performing precursor work this week ahead of an estimated $4.4 million roof replacement project at The Egg performing arts center at the Empire State Plaza complex. Bell & SPina is proud to be named an economic champion of 2016. SYRACUSE, NY – CenterState CEO recognized 295 companies as 2016 Economic Champions for their collective hiring of 3,163 employees, more than 1 million square feet of expansions, and over $650 million in capital investments. Update: Roof decking is almost done. Another step closer to a beautiful building. Registered Exterior Wall Observer (REWO®). Individuals certified to monitor the construction process to ensure that exterior wall systems stay in compliance with approved construction drawings, specifications, and best-practice or warranty-stipulated installation procedures. For complete story visit: RCI, Inc. This project was designed by Bell & Spina, Architects-Planners, P.C. The structure replaces a number of pre-engineered metal and wood sheds that housed the outdoor kilns. It will house wood-fired, gas and raku kilns as well as areas for setup and firing prep. It also includes storage areas for dry stacked wood for the wood-fired kilns, fire brick and pallets of glass cullet. Outdoor Kiln Facility at Alfred University. Dennis & Neil walking on "The Egg"
"The Egg" the Empire State Plaza’s Center for the Performing Arts, Empire State Plaza, Albany, NY. Please do not try this at home, they are trained professionals. DeAnne has joined the team as Marketing Coordinator. DeAnne has over 18 years’ experience in marketing working in various roles including event manager, advertising and social media communications specialist. DeAnne holds a Bachelor’s of Science degree in Business Management from Five Towns College. James D. Trevvett, AIA of Syracuse was hired as a Project Architect. Jamie has 18 years of professional experience with an expertise in specialized roofing and waterproofing systems and building façade restoration. Jamie will be working in both the Rochester and Syracuse Office on projects for the New York State Office of General Services and Higher Education Clients. 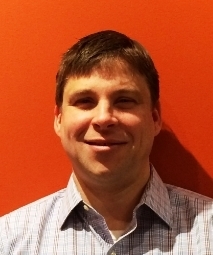 Neil Garry, PE, a Principal of Bell & Spina, Architects-Planners, has earned certifications for Building Enclosure Commissioning Process Provider (BECxP) and Commissioning Authority + Building Enclosure (CxA+BE). The University of Wisconsin-Madison developed its Commissioning Process certifications to provide in-depth training and recognition for professionals involved in the commissioning process. The certifications emphasize the importance of building enclosure commissioning and the importance of the building enclosure as the first line of defense in protecting the contents and occupants of buildings. Alexandra Rose, of Oneida, was hired as an intern architect. Rose is a 2015 Graduate of SUNY Delhi with a degree in Architectural Design and Building. She is working on projects for the New York State Office of General Services and Higher Education clients. The RCI Document Competition recognizes excellence in project documents. Bell & Spina received second place honors for Large Project Roofing/Waterproofing/Exterior Wall project documents for the Onondaga County War Memorial. In the past ten years Bell & Spina has won 3 first place awards and a second place award in the document competition. RCI, Inc. is an international association of professional consultants, architects and engineers who specialize in the specification and design of roofing, waterproofing and exterior wall systems. The Bell & Spina project you want to vote for is: MacDonough Hall, SUNY Plattsburgh. Let your voice be heard, VOTE TODAY! Its your turn to vote, in the Architects Challenge Showdown. Our project is listed as Douglas Arena, New York. Bell & Spina, Architects – Planners, P.C. Bell & Spina collaborated with the Dormitory Authority of the State of New York (DASNY) and SUNY Plattsburgh to rehabilitate the building to its original 1949 glory. The project included repairing ornamental architectural features, slate roofing and traditional copper flashing throughout the building. “The slate and copper roof, and restoration of MacDonough Hall’s cornice, are the pride of SUNY Plattsburgh dormitories. It’s all in the details.” - Gerald Maly- DASNY Field Rep II. Campus flooring helps prevent damage caused by extreme winter weather. Steeped in history, Syracuse University educates nearly 21,000 students each year. With 70 percent of students living in the school’s 22 residence halls, the team overseeing housing had their work cut out for them when tasked with finding the right flooring to cover student living spaces. The campus’s Syracuse, NY, location required flooring that could stand up to the rigors of brutal winters – including snow and salt tracked inside during winter months. The Bernthal Way plaza restoration project addressed numerous site components that had fallen into disrepair. Repairs included concrete site walls and stair/ramp cheek walls, non-functional recessed light fixtures in stair cheek walls, and deteriorated concrete around the underground transformer sidewalk grillage. The design approach revitalized the plaza while retaining the original aesthetic of the larger downtown complex.